This year I gathered my first honey, a grand total of nearly 6 cups worth. As another local beekeeper put it, the price per pound of that honey is pretty steep. Beekeeping equipment is not cheap, bees are not cheap, and our time is somewhat precious. All for a few jars of honey. Perhaps it is more about the love of bees and the joy of a hobby, at least for me. Beekeepers in my area have also said that honey production was tough this year, so I don’t feel too bad with my meager gatherings. 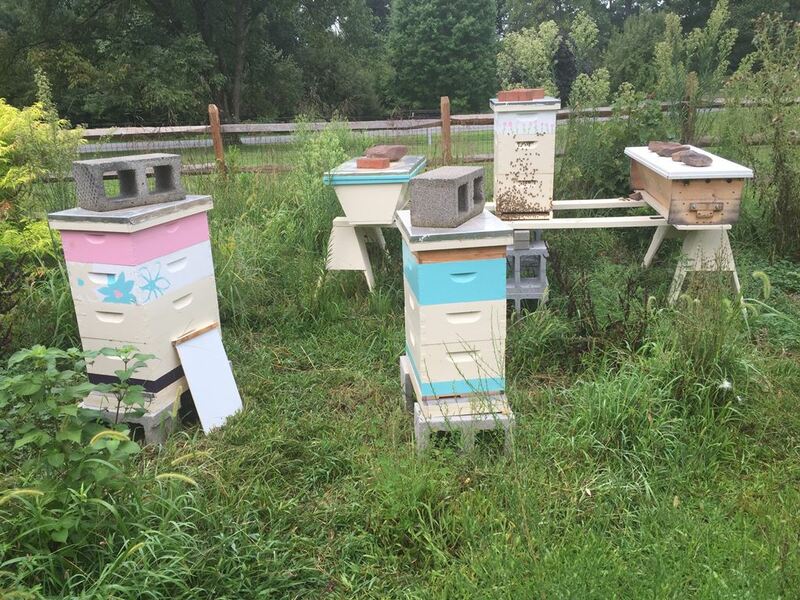 I am happy to have grown from three to five hives during the season, and appreciate the experience and knowledge garnered along the way. There sure is a lot of experience and knowledge available for me to garner. On the mite front, mites in a hive grow exponentially. Each mite produces a few new mites in about three weeks. So 20 mites become 60 mites, becomes 180 mites, becomes 540, and so forth. Non-scientific estimates, of course, but you get the idea. During the spring, the number of bees in a hive grows by up to a thousand bees per day. The mites just can’t compete. After summer arrives at the end of June, the queen lays starts laying fewer eggs and the bee population begins to shrink. The mites in the hive continue to grow, and the bees can be overwhelmed. Not right away, but in the coming winter and spring they are especially susceptible. A key factor is the number of mites you start with, and how resilient, or hygienic, your bees are. This is one reason I like my Russian bees, as they have some built-in resistance. Regardless of your bees, the recommendation is to check your mite load every month, especially in July or August, to see how they are doing. In July I checked Ganymede, my hive with the oldest queen at the time, and found a 1% load, or about 1 mite for every 100 bees. Because of their explosive growth, many beekeepers treat when the load is 2 or 3 percent, and research has found that a hive with a load of 6% in July is unlikely to make it through the winter. 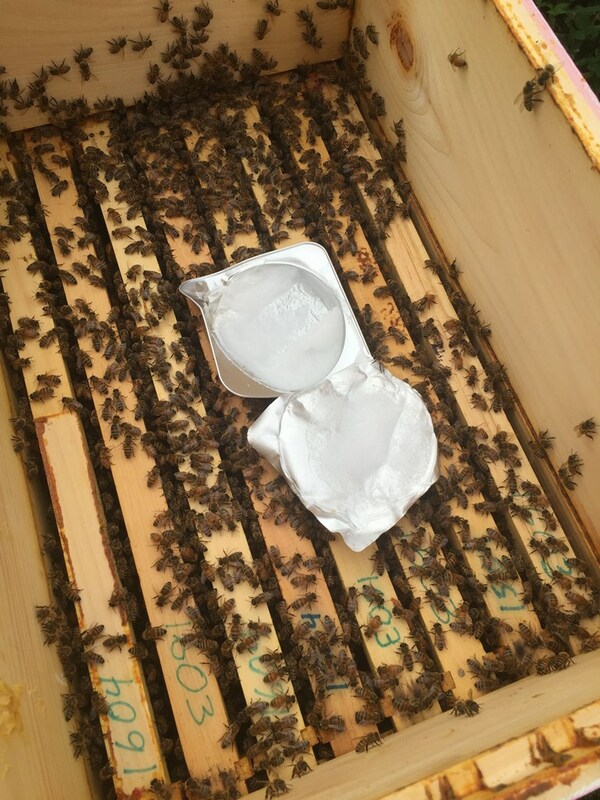 Treatment options vary: synthetic chemicals, organic chemicals, and manipulative techniques such as splitting a hive or caging the queen. Mite reproduction depends on an active queen laying eggs, so while the manipulative techniques do not kill any mites directly they do reduce the brood in the hive and therefore help manage the mite population. For me, I decided last year to head down the organic chemicals route. I will avoid the nasty synthetic chemicals, and will use some manipulative techniques where I can and as I understand them. The organic chemicals are naturally occurring compounds such as thymol and formic acid, and have less impact on the overall environment than man-made chemicals. Still chemicals, though, so some people avoid even them. I like Randy Oliver’s method presented on scientificbeekeeping.com. He prefers the organic treatments with a threshold of 2%, and using low-dose treatments to “knock down” rather than kill the mites. This approach treats the bees when a possible problem appears using a dose aimed at killing 60% to 70% of the mites. While a full dose will kill 90% or more of the mites (nothing gets all of them), it is much harder on the bees and especially the queen. The lower dose also encourages varroa resistant behavior as by design you leave mites in the hive. I experienced this out the hard way this past Spring, when I used a half-dose of formic acid on two hives and created queen issues in both hives. One recovered eventually (Mars), the other (Venus) did not and I had insert a new queen. Another factor to consider is whether to switch chemicals throughout the year. The mites will develop resistance over time, slowly but surely. Alternating treatments can help prevent this, as Rusty Burlew explains in her recent article on honeybeesuite.com. Back to my hives. On August 9 I did what is called a mite drop on Mars and Jupiter. This consists of counting the mites that drop through a screened bottom board over a few days to calculate a per-day drop. Mars was dropping more than 10 mites a day, which is high, while Jupiter was dropping less than one per day, which is low. I had used a formic acid treatment (MAQS) on Mars in April, so I decided to give a thymol treatment, Apiguard, a try. I was pretty sure Saturn and Ganymede were also high in mites, so I planned to treat Mars, Saturn, and Ganymede the weekend of August 20. 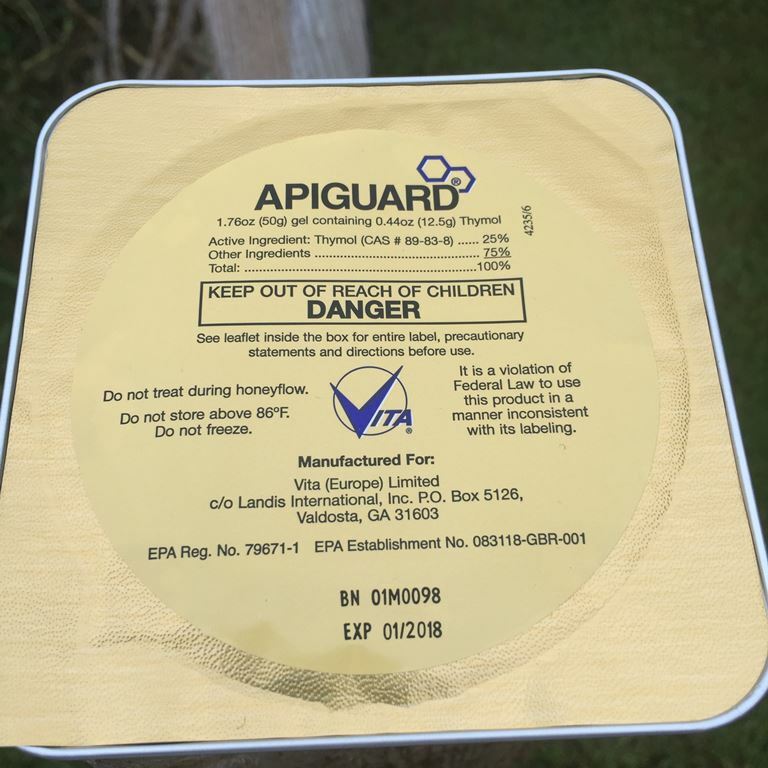 The default Apiguard treatment is 50 grams, applied twice two weeks apart. I used Randy Oliver’s method of 25g applied twice one week apart. 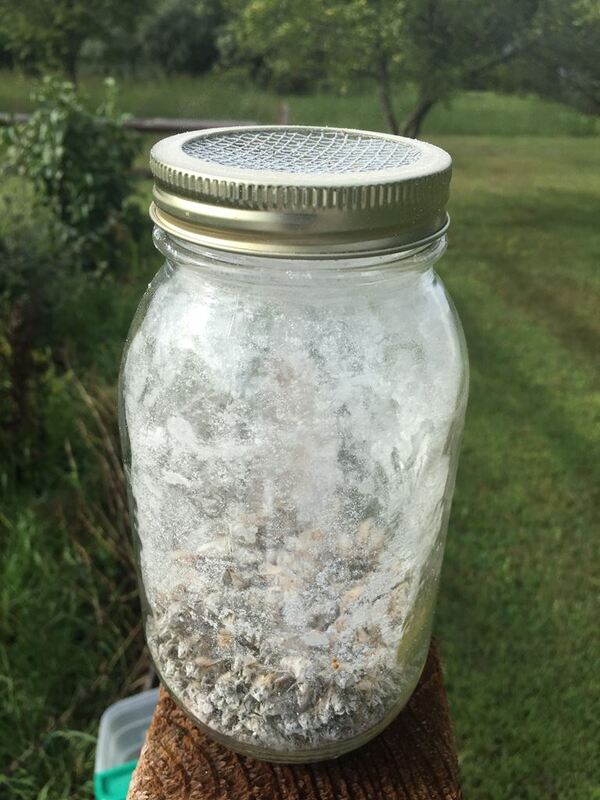 The morning of August 21 I did a sugar shake of Ganymede and found 6 mites out of roughly 300, a 2% load. Ganymede seems to be my angry hive, not terribly so but just enough to scare me away. Maybe knocking back the mites will sooth the savage beast. Since Apiguard is best applied with no honey supers on, I removed the top box from both Mars and Ganymede. Between the 16 combs, I took a meager three frames of honey. I will save these for later in case the bees need some fall or winter food. For Mars, I also removed the entrance reducer and inserted the solid bottom board. The open Apiguard package on Mars. I placed a now-empty medium box on the top of each hive to provide some air space, and opened the Apiguard package. It smells like cough drops, as thymol is similar in structure to menthol. A half-scoop went on an index card on top of Ganymede, and the tray on Mars. As I closed them up, the bees started fanning the fumes out of the hives. Poor bees; hopefully it is good for them. As for Saturn, I had a MAQS strip ready to go. I checked the mites that same afternoon with a sugar shake. In my first try I found zero mites. 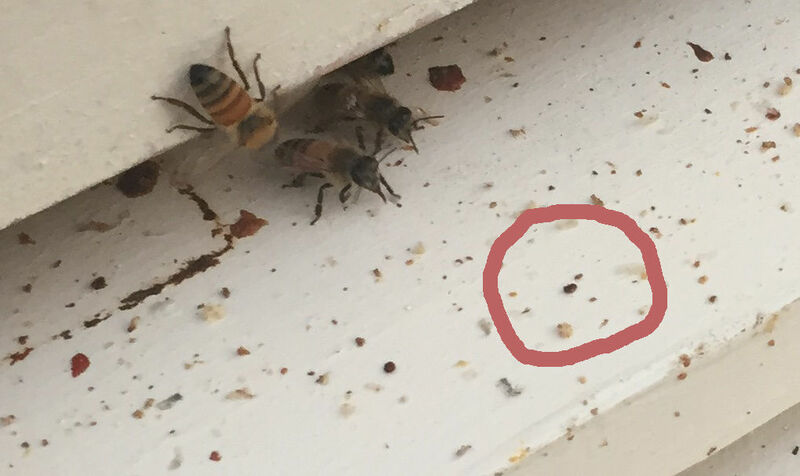 I didn’t believe the results, so I tried again and found one mite out of 300 bees. With such a low count I did not treat. Some beekeepers recommend treating every hive in a yard at once, since bees will drift between hives and carry mites with them. Not for me, however, so I was done for the day. A week later, on April 28, I applied a second 25g treatment to both hives. The following morning I could see the dead mites in front of Ganymede. The hive has a solid bottom board, so the bees have to carry out any dead mites. I circled one in the picture here. If all goes well, the treatment is not too stressful on the bees, and the mite counts drop enough to have healthy bees going into winter. If I’m good I will check the mite load again in September to make sure the tiny buggers are under control. The quote originates in the bible, as you may know. In Acts 20:35 the phrase It is more blessed to give than to receive appears. The rewards of giving outweigh the benefits of receiving help and gifts from others. In any case, enough English Literature for one post. For my bees, it seems better to give good equipment, my precious time, and the occasional food or treatment; than it is to receive honey from the hive. At least, that is my experience so far.